The Wrangler AT/R comfortably handles muddy terrain. Large shoulder notches maximise mud evacuation to help you maintain grip. Zigzag grooves with deep gripping edges deliver overall traction. Navigate wet and winter roads with tread grooves that bite the road surface and keep traction, even when it’s slippery. The silica compound adds extra grip for wet conditions. 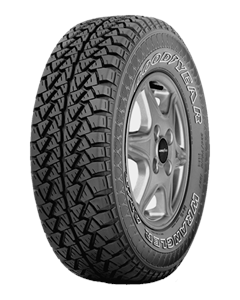 The Wrangler AT/R features a deep centre groove that quickly channels water to maintain performance in rainy weather. Even bumpy roads can be quiet ones, thanks to an optimised tread design that keeps the noise down while you drive.